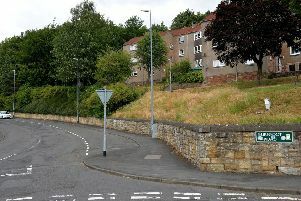 Following last week’s suspected arson attack on a brand new playground in Galashiels, council convener David Parker has said that the local authority was looking into the possibility of installing CCTV. The park, named after tragic Galashiels lad Rowan Boland, was only opened at the end of May, but smoke was spotted rising from the climbing tower last week after a what is believed to have been a failed fire-raising bid. The apparent attack was unsuccessful, but Rowan’s dad David subsequently called for closed-circuit television cameras to be installed. Mr Parker told us: “The council is monitoring the new Galashiels playpark, which is currently experiencing a very significant usage from people throughout the Borders. “The possibility of enhancing the facility will be considered and things like CCTV may be an option, but cameras don’t always have the beneficial impact which people think and there would be a range of other considerations to look at. It was also revealed that straps from swings made especially for disabled children had also been stolen, days after the park’s opening. Leaderdale and Melrose councillor Mr Parker added: “It is disappointing that straps have been removed from some equipment, but this unfortunately happens everywhere. “The straps are basically harnesses to help children with additional needs use the equipment and the council has a supply of these.